My Dayasagar review was visited by a fellow blogger called Ronald who is charting the progress of a new film on John's Gospel. The Gospel According to John is still in the very early stages of production, but already has an official website with a ringing endorsement from Jack Hayford (president of the International Bible Society). The project is already interesting at this stage for two reasons. 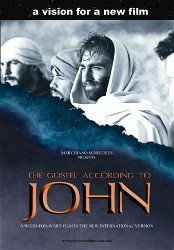 Firstly, it is only 3 years since the release of the last filmed version of John's Gospel, Phillip Saville's word for word adaptation The Gospel of John. That film was made using the Good News Bible by Visual Bible International - their third film following on from Matthew and Acts. There had been some discussion about a Gospel of Mark, including a teaser trailer buried in the "Video Clips" section of this site, but sadly it appears that Visual Bible International gone into receivership. Secondly, this new project is the brain-child of Bruce Marchiano, the same actor who played Jesus in those first two Visual Bible films. After filming those films he wrote a book about his experiences, "In the Footsteps of Jesus", and started Marchiano Minisitries. Will you play Jesus? Let me answer this way... If the cameras rolled today, yes, I would play Jesus. At the same time it would be grievous error to be presumptuous in such a holy pursuit. So even though I would love nothing more I have to be willing to lay it down for His perfect desire if He calls me to. So when it comes to casting Jesus we will make that decision on our knees before Him. That is the only way John will be all God wants it to be. If Marchiano did take the role, he would be one of the oldest actors to play Jesus behind HB Warner (who was 51) and possibly Robert Wilson (who I can't find a date for - there is a more comprehensive list of the ages of actors playihg Jesus here courtesy of Peter Chattaway). That said, some scholars at least consider that John 8:57 ("you are not yet 50") suggest Jesus was older than the more commonly ascribed 33. I doubt Marchiano is tapping into this line of thought here, but I suppose if you commit yourself to reproducing John irrespective of what the other gospels say then it's certainly a possibility. (This is reminiscent of how the Jesus (1979) film based solely on Luke did not give him a crown of thorns as that detail does not appear in that gospel). There's a wealth of information on the film at the official website and the blog. Peter Chattaway also covered this story on Saturday. I just need to say that I've seen several films on the life of Christ, including a good portion of the Gospel of John by Visual Bible, and the Matthew film with Bruce Marchiano is the first and only one of them that made me see personally how very much Jesus loves me. That made me fall in love with Him more than ever and made it possible for me to make a full surrender to Him. Glory to Jesus! I would love to see Bruce play the part of Jesus in JOHN but only if it's God's will. Thanks for your comments. Glad you found the Matthew film helped you develop your faith. Thanks for your comment. I'm afraid you're so wrong about my intentions and motivations with this post that I'm not entirely sure how to deal with it. I'll give it a go however. Firstly, as far as I recall, Mr Marchiano himself read this post when it was first written, and had no complaints. I've had a small amount of contact with him over this project, and, as far as I can tell, he seems pleased with my involvement thus far. Secondly, the phrase "brain-child" is, as far as I'm aware (and please forgive me if this is not the case) entirely neutral with regards to divine inspiration. It's just a phrase. And surely, if God did inspire Bruce to do this then it would have to have passed through his brain at some point in the process? It certainly wasn't intended to suggest this was not also God's idea. Thirdly, you say that I "imply that it's some sort of petty 'revenge' for not getting the part in Saville's movie" - putting the word "'revenge'" in inverted commas which suggests it was a quotation from my article which it is most certainly not! This, again, is completely divorced from what I was trying to say. I'm assuming that the phrase to which you took offence was "one cannot help wondering if Marchiano was disappointed not to be asked to reprise the role for Saville's Gospel of John." I actually tried to make a point of clarifying that this was totally understandable, and fully justified, by saying. "I certainly couldn't blame him, as an actor, for wanting to explore all four gospels particularly having got a taste for it after Matthew." I can't really think how better to explain it. Again I see no clash with this statement and the "plans of God", and certainly no slight on Bruce's character. If I'd delivered an acclaimed acting performance in a role, and wasn't asked back to reprise it, I'd be disappointed, as, I'm sure, most people would be. And if I'd found real purpose and inspiration in exploring that material artistically I would seek a way I could continue that exploration. I don't doubt for a minute that the first place Bruce began to seek was on his knees. So, I'm puzzled by your negative interpretation of my article, and, I have to add, disappointed that you seem to have been (on this occasion) so quick to find fault, and criticism where there was absolutely none intended, rather than giving "a brother" the benefit of the doubt and trying to understand where he's coming from. Thanks for coming back here and replying to my comments. Many would just have taken the easy way out, so respect to you for that. I'm glad I was able to clarify things in a way that made sense. I think you said you are involved with this film, is that correct? If so, please do keep in touch and let me know of any significant developments as I'm keen to report them. P.S. Oh, and about the quotes thing. I too use quotation marks around words that aren't 100% accurate, but the thing is that if you're discussing what someone has said then the natural way to read the use of quotes around a word is to assume that it is in fact quote. So I try and avoid the not-100%-accurate usage in such a context to avoid confusion / giving the wrong impression. But then my friends always tell me that I'm too pedantic, so you can take that with a pinch of salt! The "Jesus" of the Matthew film was a very poor presentation, way too much smiling for a Man of Sorrows. The gospels are not toothpaste advertisements. The "nice guy" presentation flies in the face of what the Bible teaches. Yeah I think it goes a bit too far in that direction. Not that Jesus didn't laugh - I'm sure he did regularly, but this film seems to go a bit far in that respect. I'm looking forward to this movie. Bruce Marchiano is getting closer to filming it, so I hope it will be done by the end of the year or early 2020. I really enjoy his films of Christ! He's an inspiration.